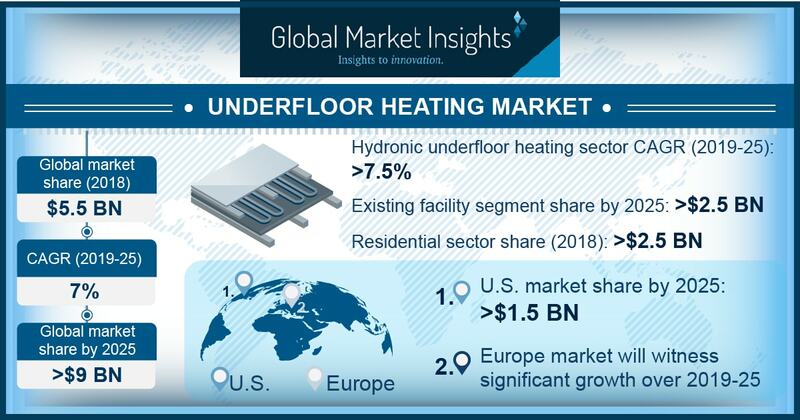 SELBYVILLE, Del., February 13, 2019	(Newswire.com) - The Underfloor Heating Market is expected to grow from over USD 5.5 billion in 2018 to USD 9 billion by 2024, according to a 2019 Global Market Insights, Inc. report. Prevailing expansion of real estate along with respective building standards and codes toward the adoption of energy efficient heating systems will drive the underfloor heating market growth. The systems are becoming mainstream with rising disposable income and declining product cost. Technological advancement along with ongoing research & development toward the product design will encourage product adoption. The manufacturers have introduced suitable electric and hydronic variants which can be easily retrofitted and installed across the existing and new deployments. The U.S. underfloor heating market has gained momentum with the rapid expansion of the service sector and prevailing directives toward the installation of energy efficient heating systems. Construction of several commercial and multifamily units across various states of the U.S. will favor product adoption. Furthermore, increased spending toward the residential renovation projects and consumer inclination toward home décor and designing will further enhance product penetration. The underfloor heating market will witness robust growth on account of growing recognition and increasing demand for central heating technologies. Extreme weather conditions along with the ongoing shift toward clean heating technologies will positively enhance the industry outlook. In addition, rising household heating demand with extensive deployment across kitchen and bathroom spaces will augment the business landscape. Growing concern toward carbon emissions along with long term energy and cost benefits will foster the hydronic underfloor heating market. The technology is witnessing increasing demand across high-end buildings and domestic establishments owing to key benefits including comfortable heating and virtually invisible deployment. However, high installation and labor cost associated with the system will affect product demand. Growing dependency on heating systems owing to subzero temperature during winter will stimulate the Europe underfloor heating industry. The regulators have introduced EU Energy efficiency directive to promote the adoption of sustainable heating systems across the industry. In addition, reduction in the installation time and upfront cost coupled with the development of flexible heating mats for small applications purposes will augment the business landscape. The underfloor heating market across new facilities will grow on account of ongoing smart cities rollouts across various nation leading to expansion of commercial and residential properties. Rising pollution have resulted in the introduction of various building regulations that mandate the installation of low emission heating systems. In addition, rapid commercialization across emerging economies will further accelerate industry growth. 1. Electric Underfloor Heating Market Size By Facility (Existing Buildings, New Buildings), By Application (Residential (Single Family, Multi-Family), Industrial, Commercial (Education, Healthcare, Retail, Logistics & Transportation, Offices, Hospitality, Others)) Industry Analysis Report, Regional Outlook (U.S., Canada, Germany, UK, France, Italy, Spain, Russia, China, India, Japan, South Korea, Australia, Brazil, Mexico, Saudi Arabia, UAE, South Africa), Application Potential, Competitive Market Share & Forecast, 2017 – 2024. 2. Cooling Tower Market Size By Product (Evaporative/Wet, Dry, Hybrid), By Technology (Open Circuit, Closed Circuit, Hybrid), By Design (Mechanical, Natural), By Build (Field Erection, Package), By Construction Material (Concrete, Steel, FRP, Wood), By Flow (Cross Flow, Counter Flow), By Application (Chemicals & Fertilizers, Oil & Gas, Power Generation, HVACR) Industry Analysis Report, Regional Outlook (U.S., Canada, Mexico, UK, France, Germany, Italy, Sweden, Netherlands, Denmark, Spain, Russia, China, Japan, South Korea, India, Australia, Malaysia, Indonesia, UAE, Saudi Arabia, Qatar, Oman, Kuwait, Egypt, South Africa, Turkey, Brazil, Argentina, Chile, Peru), Application Potential, Competitive Market Share & Forecast, 2019 – 2025. North America's gas generator sets market is expected to register more than a 6 percent CAGR by 2025, owing to the abundant availability of natural gas, which is favored by expanding LNG infrastructure and shale gas. North America is a leading participant in the space robotics market owing to presence of national organizations, including NASA and CSA, that are actively working toward the industry's development.